SCAL will be participating in the Arts in Bloom tour by providing a children’s watercolor activity. We have done this for the last several years. It has become a favorite among the families who take the tour (we have had a number who come back each year), and it’s also fun for the SCAL members who volunteer to help out. Here’s how it works: We give the children their choice of black line drawings with various subject matter that they can paint with watercolors. I have some drawings left from last year, but it’s best if we can have a large variety for the children to choose from. Below are a few samples from previous years. The subject matter is up to you. Drawings do not have to be detailed (but they can be). Drawings can be very simple. Think of a coloring book page. 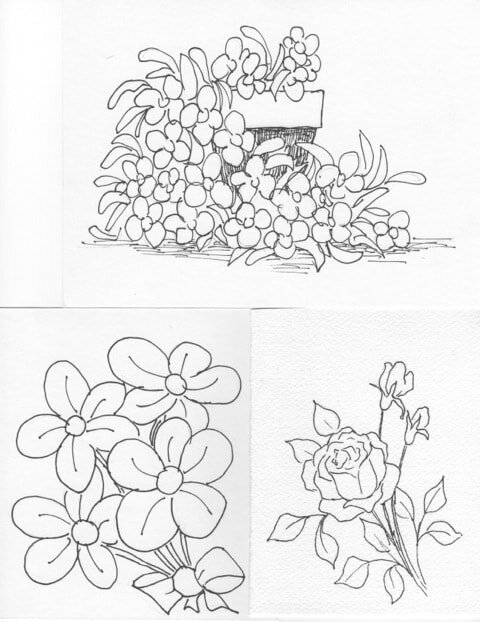 Drawings should be from 5x7 to 3x5 (or close). The size doesn’t have to be exact but no larger than 5X7. Drawings can be brought to the March and April SCAL general meetings or to any Thursday painting session at the Agriculture Center on Cheney Road (behind Vo-Tech) by Noon. Drawings may be signed by the artist or not, your choice. This Dig into Art activity has been very popular over the years. Part of the attraction is that the drawings have been created by Art League members. It can be a success again with your help in providing your original work to which the children can provide their own creativity.